Which one of these arseholes is clinically crazier? We know The Donald is bonkers – hypomanic, with a side of narcissistic personality disorder – from his many TV appearances, subsequent actions and Tweets. And while Fatboy Kim is less well known, we can make an educated guess as to his mental state. He has to have six matching microphones whenever he speaks – and when no mics are present, the little grinning men with flat hats and heads who surround him have to carry little notebooks and pencils to write his “sacred” words down. Oh, and he had his uncle (and the man’s entire family) and half-brother killed. A real charmer, he. So, at the risk of over-simplifying, what we have here is two spoiled brats – grown up. The problem is, their TOYS are NUCLEAR – capable of KILLING MILLIONS OF GROWN-UPS (and their children). Instead, what I would like to see is something like the video of Frankie Goes To Hollywood’s “Two Tribes” – where these two grotesque loons climb into a RING and DUKE IT OUT – thus hurting no-one other than THEMSELVES. 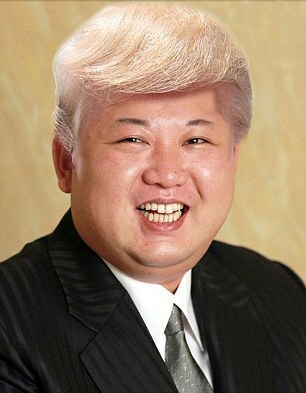 Of course, some would call it an unfair contest – given Kim is literally half Trump’s age.